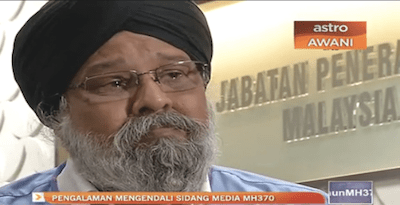 One Sikh became a familiar face in the media in days following Malaysian Airlines (MAS) plane en-route to China was reported missing in March 2014. Jagjit Singh, an assistant information officer from Malaysia’s Ministry of Communications and Multimedia, was thrust into the limelight as moderator of the daily media sessions. It was no mean task as the numbers could swell up to 600 strong – from 33 countries and 281 news agencies — with many of them jostling with each other, asking tough questions. But Jagjit kept his cool. Soon, he became a familiar face to Malaysians and the millions of viewers tuning to the live media conferences. One year later, MH370 has yet to be found. Local media channels, as expected, ran a series of articles on the incident. Astro Awani, a local news television news channel, recently interviewed Jagjit on his experiences. The interview was conducted in Malay. Jagjit Singh was tasked to moderate the daily media session at the height of the MH370 missing plane incident. “I was given the task by default. They could not contact the officer who was supposed to handle the task,” he tells the television station in impeccable Malay, the national language of Malaysia. Jagjit says the lost of life in the incident did not really sink in until he lost a relative in another tragic air accident four months later. On 17 July 2014, a MAS Flight 17 from Amsterdam to Kuala Lumpur was shot down over Ukraine, killing all 283 passengers and 15 crew on board. The MH370 flight was carrying 12 crew and 227 passengers. “I knew how it feels because on MH17 I lost a very dear friend,” he says, holding back his emotions.